You simply have to try making soap bubbles with your hands! You can touch and for example catch the soap bubble if you have wet hands. Shape your finger to form a closed loop and dip them in your soap bubble liquid. Now you can blow bubbles right from your fingers as i you were using a wand. If you use only one hand, you can form the loop by letting the forefinger and thumb touch. If you are using two hands you can for example let the two forefingers touch and the two thumbs. There are two things you will need to learn: a) Close the bubbles so that the air is not flowing out of the bubbles by closing the finger loop. This can be a bit tricky and you will probably have to try train it a few times before you have developed you favorite method. If you by accident open the loop the bubble will break. b) To let the bubble go from your hands try accelerate the movements of your hands while minimizing the area of the contact plane between hands and bubble. A wand is that thing that usually comes with the soap bubble liquid you buy in a toy store and that all kids have used for making soap bubbles. It is a small stick with a ring at the end that is dipped into the bubble liquid. Usually wands are used for making small bubbles, for example ping pong ball size to tennis ball size. You can, however, make larger bubbles (maybe up to handball size) by repeatedly blowing very softly. Combined with a straw, wands are the ideal tool for many soap bubble tricks when the wand is both used for making and for holding the bubbles. To do such tricks it is important to be able to close the bubbles so that the air can't escape. There are two methods: a) turn the wand 180 degree so that the side of the wand you are blowing into is facing the bubble, b) let go of the bubble with the wand and catch it again. A straw is a very simple tool for making soap bubbles. Dip one end in the bubble liquid and blow in the other end. Don't blow to hard or the bubble will break. If you blow softly several times on the same bubble, you can make a relatively big one (size of a grape fruit). If you blow a bit harder you will make many small bubbles instead. A tristring is a simple tool made by two sticks and a loop string. It is an excellent tool for making big soap bubbles and long soap bubble tubes. 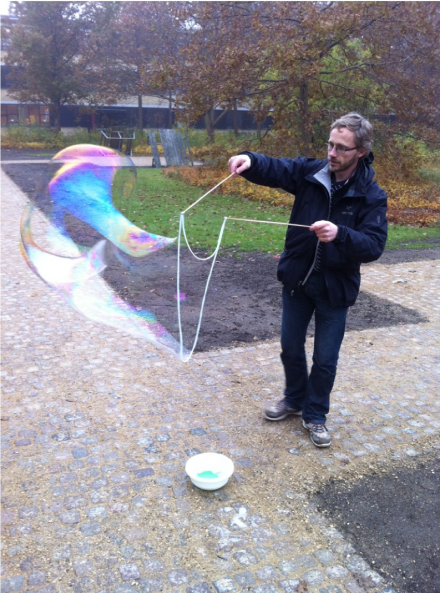 A relatively large soap film is made inside the string loop and a mild wind helps to blow the bubble. The difficult part is to close the bobble and let it escape the tool. This is done be putting the two sticks together to close the string loop. The tristring is invented by the toy inventor Kalvin Klundt and has been sold in toy stores. A ca. 10 inch long tube with a diameter of ca. 2 inches is a good tool for making big bubbles (basket ball size) and ideal for making bubble domes on a wet surface. You can use plastic, glas, cardboard or basically any kind of tube you can find. A light table is not a tool for making bubbles but for enhancing the beautiful colors of the soap bubbles. When using at light table in a dark room, the soap bubble colors appear clearly because the light reflected from their back surface is not dominated by light from other sources. See for example this movie of bubble domes on a light table. A very nice add-on to a light table is a light so-called monochrome light source such as a low pressure sodium lamp or three LED light sources with the fundamental colours red, blue and green.